An appetizingly crispy and nourishing Indian starter, Chicken Pakora is served with a variety of sauces in many grand parties. These chicken pakoras are quick and easy to make. Chicken Pakora is marinated in spices which add taste to this. These pakoras can be made in different ways. Mix together chicken, cabbage and carrots. Season with turmeric, chilli powder, ground coriander, cumin, tandoori masala, salt and fresh coriander. Add gram flour and just enough water to create a smooth, heavy mixture that clings the chicken and vegetables. Mix well. Scoop out with a slotted spoon and drain on kitchen towels. Serve hot with a variety of sauces, such as hot chilli sauce, plain yoghurt or tamarind sauce. Special instruction: Chicken Pakora should not be fried in very hot oil. 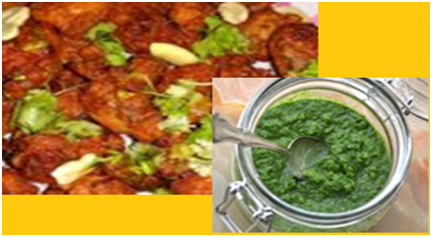 These spicy Chicken Pakoras will be definitely liked by guests in party.